On December 1, 1874, Luis Maria Guerrero, a Bacteriologist, Pediatrician, and Helminthologist was born in Ermita, Manila to Brigido Guerrero and Maria Alvarez. Guerrero, a professor in Clinical Pediatrics at the University of Santo Tomas and later as head of that department, was also an uncontested authority in Tropical Medicine. Dr. Guerrero possessed an amazingly keen memory and a pair of clinical eyes which aided him in making a snap diagnosis of patients, rarely using a stethoscope. His diagnostic ability was legendary for he oftentimes could visualize what many physicians failed to recognize. His unusually sharp sense of perception was a distinguishing mark through which he had achieved fame. One of his chief virtues as a doctor and professor of medicine was his noble spirit of self-sacrifice for ailing mankind. It was known that a good number of times, he was assailed by abdominal pains or colic while prodding patiently on, and administering the sick. He would take his meals, which consisted mainly of a can of "Bear Brand" milk, in his car, just so he could carry out his heavy daily schedule of visits. He knew the moral imponderable, curative value of the presence of the physician and his presence to many patients radiated and infused confidence, hope, redemption. He was also a writer in his younger days, a contemporary of such foremost Filipino authors as Cecillo Apostol, Rafael Palma, Fernando Ma. Guerrero, and Manuel S. Guerrero. Most of his literary works were short stories revealing his keen sense of humor and his mastery of the Spanish language. His love for the Spanish classics and literature in its varied forms revealed his rich literacy background. He was multi-lingual; his mastery of English, French, Chinese and Italian languages were fruits of his intense desire to learn. These languages were all self-taught which implied that diligence and patience were so much a part of him. The literary field was not to be his career for long. As a student, he finally turned to medicine after completing his Bachelor of Arts degree at the Ateneo de Manila in 1893. Dr. Luis Maria Guerrero married Adela Henry, a French mestiza, with whom Dr. Guerrero had ten children. He died of diabetes on August 12, 1950. On July 4, 1948, President Elpidio Quirino bestowed upon him an award for his distinguished service to the country and in recognition of the impact of his achievements on the medical profession. 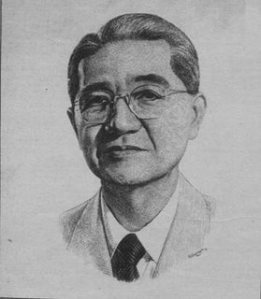 His alma mater, the University of Santo Tomas, honored him as its most distinguished alumnus for the year 1946. Photo credit: UST Medicine 1967 Foundation USA, Inc.